Metamorpho is becoming cocky - VERY. He's taking on challenges alone, because he doesn't need back up. He is after all - a one-man team! He in turn manages to hack off the entire JLU with his snooty attitude. On missions he makes his team mates watch from the sidelines as he takes villains on his own. The Atom tries to reach out to his friend, reminding him the JLU is a TEAM. Rex laughs it off and lists his triumphs battling bad guys like Metallo, Solar Flare, Psycho Pirate and even the Brotherhood of Evil. By the end of the week Rex is being segregated by the team and shunted to monitor duty, at first Rex feels down, regretting his behavior, this is quickly replaced by an assumption of jealousy. When an alert reaches the satellite, Rex decides to take it on alone. At first his "all guns blazing approach" works wonders, right up until the moment Matter Master appears! Rex's powers come from the elemental table and Matter Master controls matter in the same way! For the first time Metamorpho is scared... with good reason - Matter Master promptly liquefies Rex! Atom leaps from Rex's belt and grows to full size. Before Matter Master can retaliate the JLU arrive and distract the villain. This distraction is more than enough for Rex to recover and he knocks out the bad guy! He declares he is part of the Justice League - a TEAM... a lesson he just learned. Since that day Rex combining his powers with his team mates has made them an even more powerful team! 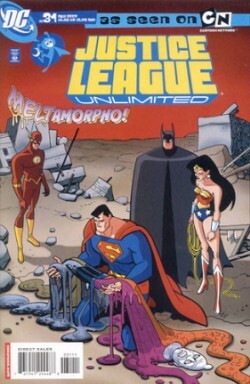 Art - 4: A fun take on the JLU this issue, reminiscent of the later issues of Superman Adventures. Cover Art - 4: Almost made me LIKE this issue! Sadly the cover lied and Rex didn't die so its docked one point.